Mary grew up in San Francisco, California where she enjoyed the many experiences the city offered. She is the only daughter of Michael and Mary Duffy who both emigrated from Ireland. The Irish Catholic culture was a big part of her life. She followed her older brother Michael and attended St. Cecilia’s School from K-8 and loved her experience with the Sisters of the Holy Names who taught there. After graduation from Mercy High School and attending one year of college at San Francisco College for Women, Mary entered the Sisters of the Holy Names of Jesus and Mary in Los Gatos, California. She taught elementary school for eighteen years, mostly primary grades and a few years of Montessori. She also did a year of teacher training for the San Francisco Archdiocese. Mary has been doing art all her life, but especially since 1982, when she started taking classes for her art therapy master’s degree. After graduation from the University of Notre Dame de Namur in Belmont, where she received her Masters in Art Therapy, she went to work with abused children at Maryvale, a residential placement in Southern California. Moving back to Northern California in 1989 she earned her MFT and became a school counselor, and then a resource teacher. Children and their well-being have been the main focus of Mary’s life, but art has always been something that has sustained her in this work. 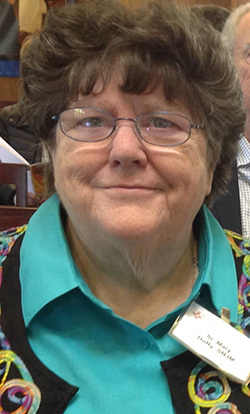 Mary took an active part in the American Art Therapy Association serving on the Standards Committee for 7 years as a member and then chairperson, and was instrumental in setting up standards for licensing throughout the United States. She was also the National Treasurer for four years. Mary was supervisor for many beginning art therapists and taught Childhood Psychopathology every summer for five years at the University in Belmont. One of the major opportunities she had as an art therapist was to go to Kiev in Ukraine for three weeks. There she worked with street children and their care givers, helping them deal with trauma through art. This was a challenging and rewarding experience. Mary has dabbled mostly in watercolors until the last few years when she began to devote more time to this exciting medium. While Mary enjoys many mediums and likes doing crafts and quilting, watercolor is her first love. The last few years while dealing with illness, Mary has had more time to spend painting. A few years ago she had the great joy of having one of her paintings accepted to be in a slide show at the DeYoung Museum in San Francisco. After moving to Merrill Gardens in Campbell, Mary started teaching seniors painting and coloring, which has also evolved into teaching art in the memory unit. This brings her great joy. Mary has had several art shows where she combines her art with her poetry. Her art grows out of her prayer experience and she sees it as a way of sharing God with others. She also supplies greeting cards to two gift stores in San Jose area and is part of boutiques that raise money for the Sister’s retirement fund. Mary has found the last fifty years in community challenging and a blessing. She is most grateful for the wonderful people she has met through her ministries, and the precious community relationships she has shared over these years. She is grateful for these blessings and is happy to be celebrating her jubilee.